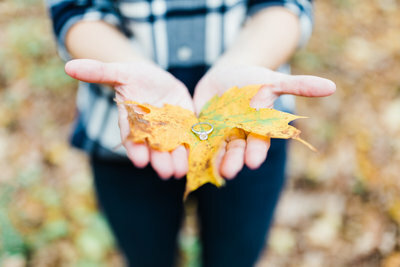 She has followed my work until Matt proposed and then called me right away to do their photos! I was super lucky in that Matt was currently living in Colorado to finish up a job so it worked out perfectly that Jaclyn flew to Colorado and we met up at Pikes Peak to do their engagement session and it could not have been more dreamy! We made a pit stop at Crystal Lake Reservoir on our way to the peak and got some really beautiful photos of the changing aspen leaves reflecting in the water. Do you see that gorgeous peak and fall colors? Colorado is quickly stealing my heart with these beautiful seasons, incredible color changes, and snow! Then made our way up to do the formal photos at the top of Pikes Peak. We danced, froze our booties off, and caught some insane sunset light! Thank you so much Jaclyn and Matt for trusting me with your special photos and I can’t wait for your wedding! We are going to have a blast!!! This engagement session is beautiful! All the heart eyes over those views and that wind blown hair!